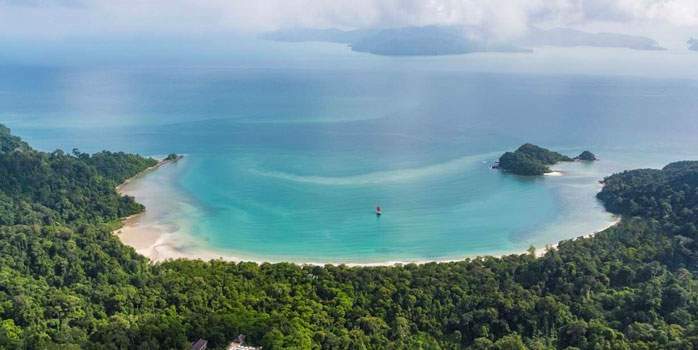 Just an hours flying time from Kuala Lumpur, this archipelago of islands is situated 20 miles off the west coast of Malaysia near to the border with Thailand. 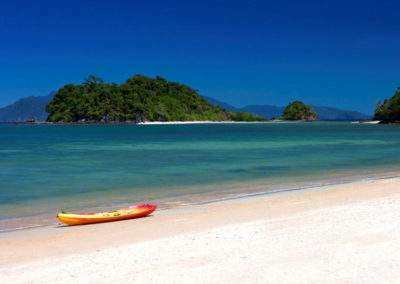 Langkawi enjoys a reputation as Malaysia’s premier golf holiday retreat, offering quality golf courses, white sandy beaches, mountainous interior and stunning natural attractions. 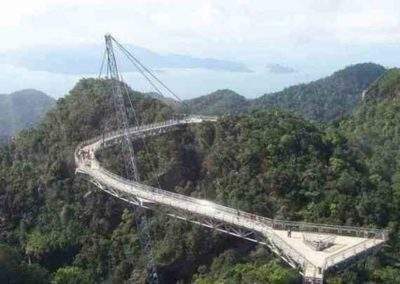 These include Telaga Tujuh – a series of pools between which visitors can slide, some splendid waterfalls, hot springs and day trips to deserted islands. A new course with lofty ambition that presents a wide variety of challenges from undulating forests to open links-style holes. Only 9 holes open at the moment but due for completion at the end of 2013. 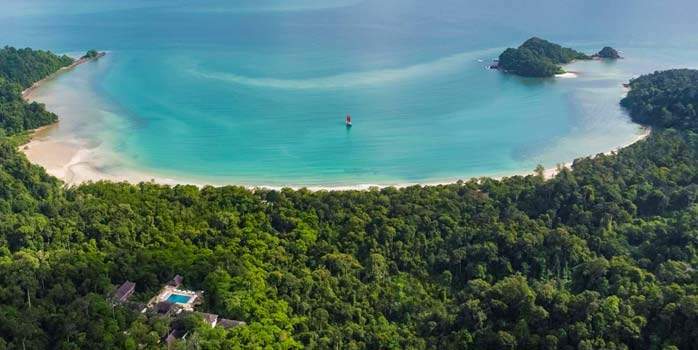 On the oceanfront between Pantai Centang and Kuah Town lies the brand new 99 East Golf Club, the first Malaysian course to be managed by the US-based Troon Golf. Unexpectedly for a club that required the movement of millions of tonnes of earth and the planting of hundreds of new plants and trees, this championship course doesn’t feel contrived and somehow compliments a surrounding natural environment made up of native forests, wetlands and orchard valleys. The opening holes play uphill to the highest point, from where you can enjoy some spectacular views across the entire island. From there, the epic par-5 6th which satisfyingly sweeps down through the forest towards the valleys below. The holes along the ocean have a distinct scottish links feel, with wild native grasses and reeds framing the open holes instead of trees. Less reminiscent of the UK are the rice terraces that skirt the course. 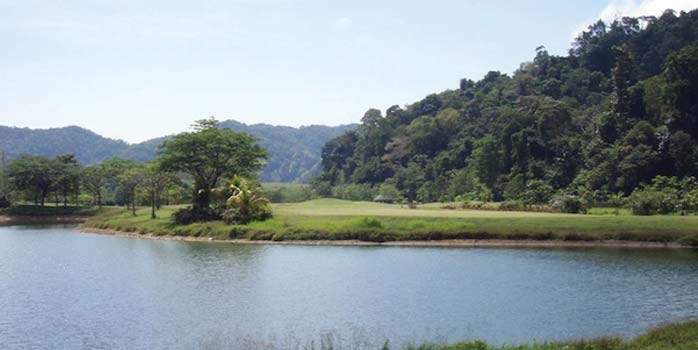 It’s a tough course with a variety of challenges, from the undulating forests to the flat, windswept oceanfront holes, and it’s easy to imagine that the course was named after the average score round here. 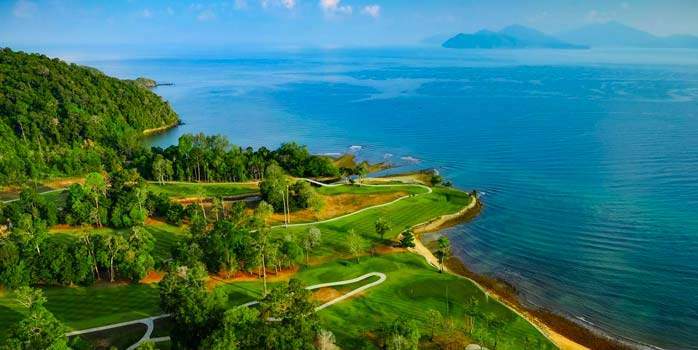 But with its combination of well-designed holes, memorable views, and sea breezes, somehow the score you get at 99 East Golf Club doesn’t seem that important. It won’t win any awards but it’s a decent open course which is perfect for high handicappers. 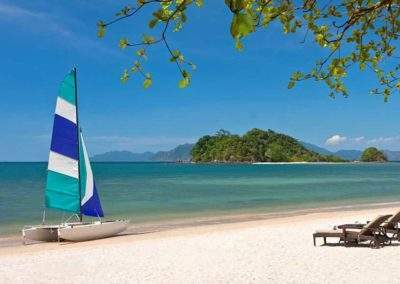 Take plenty of water and sunscreen. 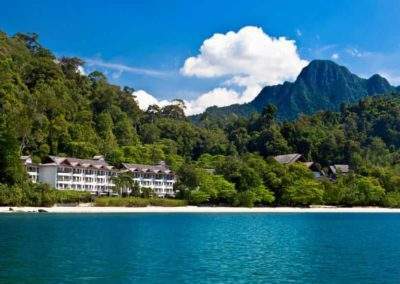 In the foothills of the majestic mountain from which it takes its name you’ll find Gunung Raya Golf Resort set in 300 acres of what used to be a rubber plantation. 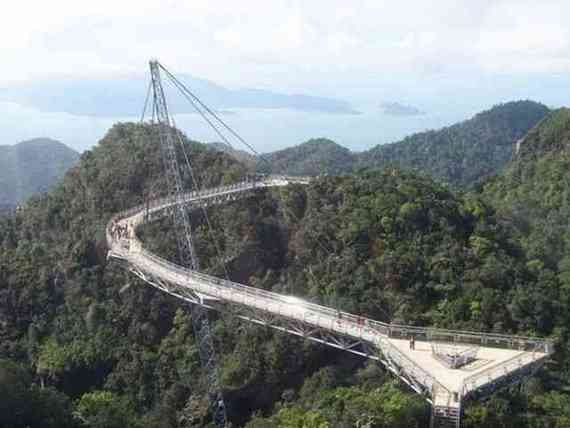 Designed by American Max Wexler, it’s a useful addition to the limited options for golf in Langkawi. From the elevated tee on the 1st, a slight dog-leg right, you get a great view of the distant mountains and a pretty good idea of what the course is going to throw at you. The Bermuda fairways are generously wide and inviting, with plenty of leeway for those of us who are less than reliable with a driver. There is almost no OB and not too many hazards so there’s not that much to lose by going for it off the tee, certainly on the front nine. Having said that, the 225 yard par-3 7th features a tricky two tier green flanked by bunkers and exposed to some stiff breezes, so don’t think you’ll have a straightforward time of it on every tee. After the turn there is more in the way of foliage and you start to encounter water – the 10th is a beauty, a long par-5 dog-leg right with water all the way down the left and a fairway peppered with bunkers. One slight complaint is that certain sections of rough are just too thick, and it’s easy to lose a ball that you would never expect to lose. Part of the problem is that the drainage doesn’t seem to be perfect, so you can end up plugging your ball in a soggy patch of rough, even in the baking sun that is the norm. 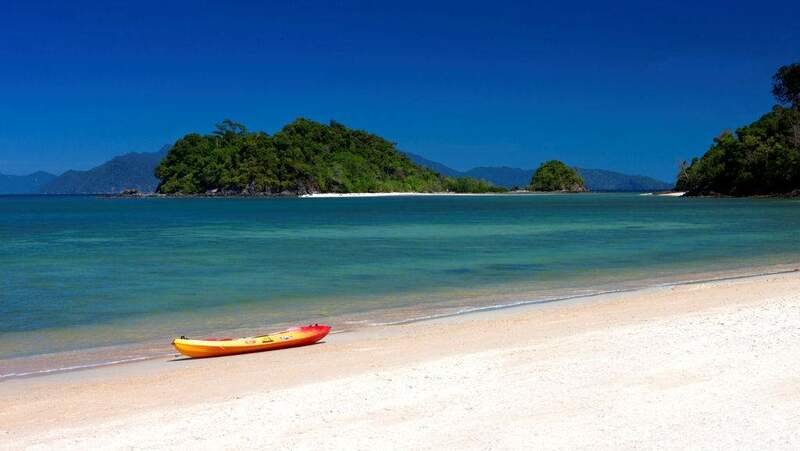 On that note, remember to take a hat and sunblock as it really is hot in Langkawi, and given this is a fairly new course the trees are yet to reach maturity and so offer little in the way of shade. 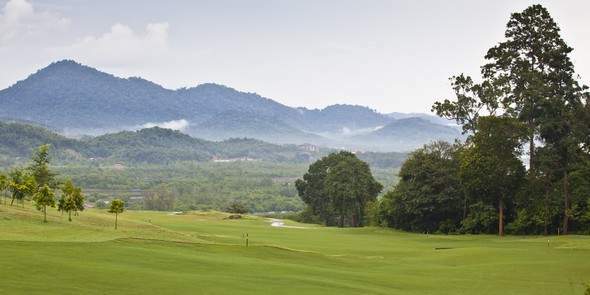 Overall, this is a decent course that won’t be winning any awards but nonetheless provides enough to satisfy those who need to scratch that golfing itch and can’t get on the course at Datai Bay; probably best played on cooler days as the heat can really get oppressive at Gunung Raya Golf Resort. 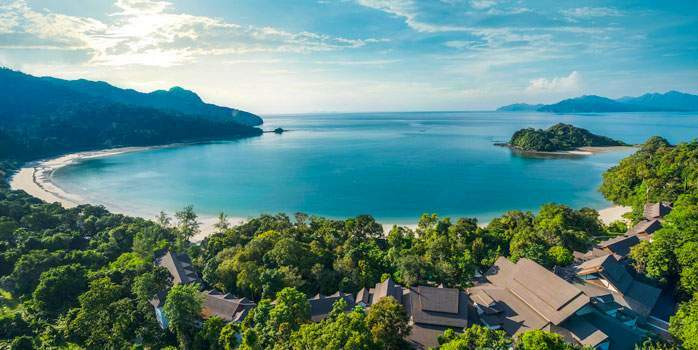 Nestled between the primeval rainforest and the emerald green of the Andaman Sea, the award-winning, 18-hole, par-72 championship golf course at The Els Club Teluk Datai, designed by legendary player Ernie Els, provides a grand game experience in one of the world’s most spectacular settings. 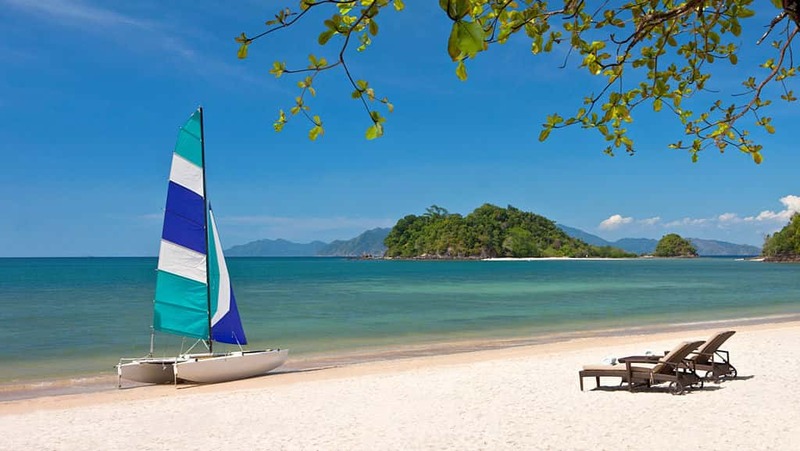 The Els Club Teluk Datai also offers state-of-the-art club facilities, including buggies equipped with GPS units, a fully stocked golf shop and full-amenity locker rooms, as well as two relaxation areas in the clubhouse. The Hornbill Café, which overlooks the course, and the open-air Els Lounge are the perfect place to unwind after your round. 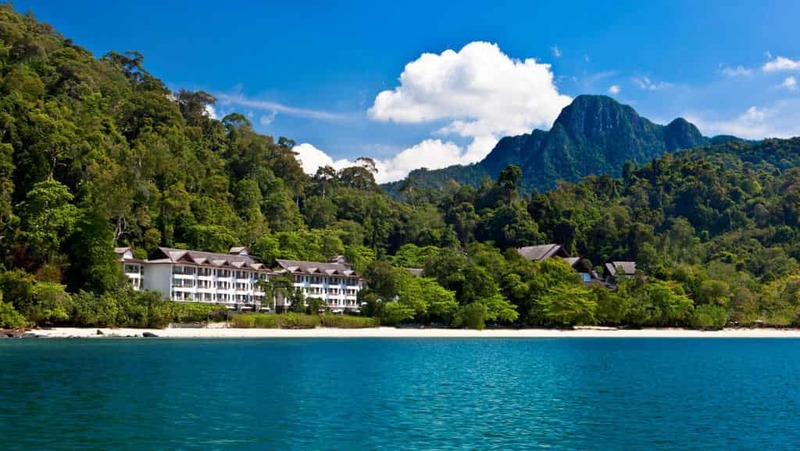 Surrounded by melodic birdsong and rainforest, The Andaman, Langkawi, offers stylish modern convenience in a relaxed island setting. 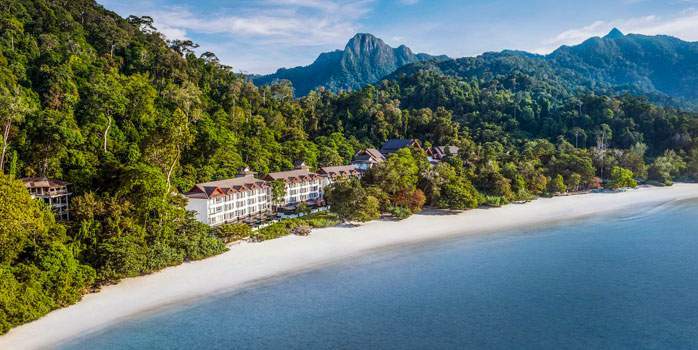 The newly refurbished Datai Langkawi is a luxurious Malaysian golf holiday & honeymoon destination resort nestling in the heart of a 10-million-year-old rainforest, set against a backdrop of primordial mountains.